He cited pastors who are jailed for no other reason than being a Christian leader and Believers who have been brutally tortured just for practicing their faith. "Christians have been lashed, do you hear this, lashed for sipping wine during prayer services," he said. 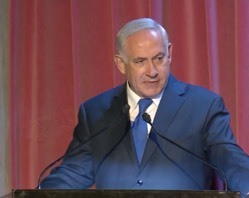 Netanyahu has been warning the world about Iran's terrorist activities and nuclear ambitions, but he said on this night that he wanted to turn his attention to the persecuted. "Some world leaders are willing to ignore this repression and seek to appease Iran, but I am not one of them. I think that how a country treats religious minorities is a very good indicator of how it will treat its fellow citizens and its neighbors." He then encouraged the Christian journalists to highlight Iran's suffering Believers. "Dedicate this week to outlining the plight of the countless Christians suffering under Iran. Profile the brave Christian leaders jailed for practicing their faith. Sit with the families, the schoolteachers jailed for years merely for converting to Christianity ... Call out the lies of President Rouhani, who promised in 2013 that all religions would, quote, "feel justice" in Iran while so many Christians live there in constant terror," he said. Sponsored by the Government Press Office, the Foreign Ministry and the Prime Minister's Office, the summit has brought more than 100 Christian journalists and speakers from around the world to learn about Israel's Biblical and modern history, and its security challenges. Netanyahu's address at the Israel Museum kicked off the summit. The Israeli leader praised President Trump for his action this week seeking to impose changes to tighten the nuclear deal with Iran signed by the Obama administration. "It made a big impression on America's allies here. And it made a big impression on Iran. They should be worried, justly so," he said. He noted that the Iranian threat is two-fold: the possibility of gaining a "vast arsenal" of nuclear weapons and its aim to create a "Shiite Arc" of influence in the Middle East. "It wants to build the Shiite Arc—Iran, Iraq, Syria, Lebanon—and it's working. They want a Shiite arc to colonize and control. It is an act of unadulterated aggression," he said. At the end of his speech, the prime minister took questions from some members of the press. CBN News Middle East Bureau Chief Chris Mitchell cited Israel's relief efforts to victims of natural disasters around world and asked Netanyahu why, with all the dangers and struggles the tiny Jewish state faces, it rushes to help others. "Because we're a light unto the nations, that's the fulfillment of that great prophecy. That's what Israel is doing," he said. In recent months, Israel has sent relief goods and rescue teams to victims of the hurricanes in the Caribbean and the U.S. and the Mexican earthquakes. "People say, 'Well what are you doing? What is it that you get out of it?' And the answer is we're not getting out of it anything. We're fulfilling our deepest values. Israel is a light unto the nations."